A few years ago, while out for a walk in our neighborhood, I discovered a Canadian goose with a broken wing. Unsure of what to do, and worried about her ability to survive winter, I did some research and found a pretty remarkable place just north of our home called the Center for Wildlife in Cape Neddick, Maine. The woman who answered my hotline call at the center was able to give me helpful advice about what to do to get the best care for the goose (she connected me with a local wildlife rehabilitator). That phone call began a love affair with their organization – although they didn’t know it at the time. I signed up to become a member, started receiving their newsletter (which I read cover to cover) and began making regular donations (I like to put my money where my heart is). Last Thursday, I had the pleasure of visiting the Center for Wildlife to tour the facility with Emma Balina, their Development Director. Despite their humble surroundings – a 1200 square foot ranch house with several outdoor enclosures – the Center for Wildlife is a pretty amazing place. They field 15,000 hotline calls a year from worried folks with injured birds and animals and they usually have between 150 and 170 animals in their care at one time. The center hosts 80 volunteers and up to 35 interns from around the U.S., many of whom go on to study zoology, marine biology, environmental science, wildlife ecology and veterinary medicine. I intend to share more about the center with you in future blogs, and this week I wanted to start with some fun and important facts I learned during my tour. ~*~ Bats eat 1000 mosquitos in an hour, which is one of the reasons I had several bat houses installed on our property a few years ago. One of our bat houses provides shelter for more than 60 bats. ~*~ A single squirrel can bury several thousand acorns a year and because they’ll forget where 75% of them are, we get to enjoy new oak trees. ~*~ Speaking of squirrels, did you know that they have rotating ankles so they can climb up and down trees while always seeing where they’re headed? ~*~ Contrary to popular belief, porcupines do not shoot their quills. If you or your pet gets stuck, it’s because you got too close. Porcupines have few enemies because they’re not easy to munch on – the fisher is their primary foe. ~*~ Box turtles eat tick and mosquito larvae and they live below the frost line in winter. They stop breathing as they rest for the season. ~*~ The next time you see squirrels chasing each other, they might be on a date – chasing is a mating activity . ~*~ Squirrels make 2 or 3 nests in case one gets blown down. ~*~ Turtles nesting destinations are embedded in their DNA. This is why we need to be careful while driving in the spring and fall season here in the northeast. Turtles have been following nesting maps for hundreds of years and these paths often take them across roads. ~*~ We should only trim trees between October and April to protect the homes of birds and animals. ~*~ And a surprising, important guideline: Never throw food out of a moving vehicle. While your apple core or half-eaten banana might seem like a great snack for critters, often the food lands near the road, and when the animal moves in to eat it, they end up getting hit by a car. I’m told this is an ah-ha moment for many visitors. Finally, I was surprised to learn that out of every dollar donated to charities in the U.S., only one penny goes to helping animals. While our fellow humans certainly need our support (especially now with several natural disasters happening at once), it’s important to remember that birds and animals are our first line of defense. They alert us to environmental issues that ultimately affect human health and well being. Also, developing meaningful relationships with birds and animals inspires us all to fall in love with and protect our beautiful Earth. I’m grateful to have such an important wildlife refuge near our home and I look forward to continuing to support their efforts. If you’d like to join me, you can learn more about the Center for Wildlife here. 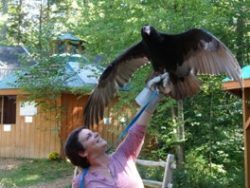 Oh, and be sure to stay tuned for videos, more fun facts, and other helpful information from the center including photos like this one of Sarah Kern, the educational and outreach coordinator, with her buddy, Violet, a turkey vulture. Check out what this woman did when she missed her connecting flight. Instead of beating herself up, she practiced smart self-care. Watch what happened here. Thanks, Terry!